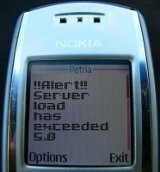 The most robust solution for sending SMS notifications of server issues detected by Nagios is well-known – plug a GSM modem (or a mobile phone) into your server directly and use that as the delivery mechanism. It’s true out-of-band communications, so if the backhaul fails completely, you still get notified. However, for someone who has a small server like mine, in a geographically remote location (like Germany, in my case), that may be overkill. Especially as the cost includes both the initial cost of the hardware and the ongoing service charges. 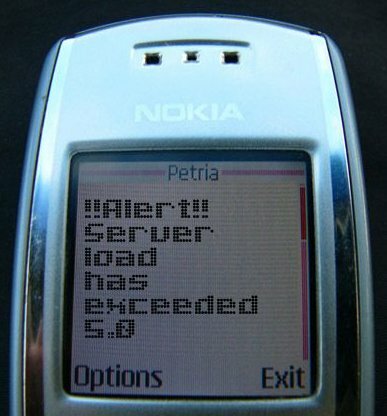 And for true out-of-band notification, you need far more admin time than may be appropriate for a small site; you have to have scheduled test of out-of-band notifications lest the hardware fail without detection, and so forth. In my case, the requirement is far lower-spec; I just want to get a quick ping if the server starts to die so I can log in and try to effect repairs. If it’s an actual hardware failure, or an actual backhaul failure, odds are good that I can’t fix it from my end in a few minutes anyway, and we’re past the “fix it” part of the disaster recovery plan (you do have one, right? ), and into the “get another temporary webhost and redirect using DNS” part of the DR plan (you do keep regular backups of your site locally, right?). Given the pricing structure in clickatell, it’s quite affordable – at the rate of normal usage, I should get a year’s coverage for around €50 or so, with capacity to spare. So it’s easy, cheap and testable. It’s not true out-of-band, but as 80% solutions go, it’s not too shabby. $NOTIFICATIONTYPE$ $HOSTNAME$ Just need to add this command then it will show in the SMS the host name which is having issues. Great post. Helped me. But how to specify multiple mail ids? I can get notifications to one number only.